If you know anything about the Calvin Coolidge administration dogs, you probably think of white collies. The first family had many portraits taken of themselves with their beautiful collies, Prudence Prim and Rob Roy. In fact, the Coolidges helped to make the breed popular with Americans long before the Lassie TV show. You may not know, however, that the Coolidges also helped introduce the Shetland sheepdog, which looks like a miniature collie, to us as well. When the news of Prudence Prim’s untimely death hit the newspapers and radio, two Michigan children wanted to send the presidential family a new dog. They sent Diana of Wildwood, a registered Shetland sheepdog, who was at first called a “Scotch collie” by the press. The children had chosen Diana because she was all white just like the first lady’s beloved Prudence Prim. When the puppy arrived by plane, she appeared to be a black-and-white spotted dog. However, when the President picked up the dog, and the spots transferred to his clothing, everyone realized the “spots” were really patches of dirt and grease. The lively young Sheltie continued to rummage into things and get herself dirty in and around the White House — so much so that the first lady renamed her Calamity Jane in honor of the American frontierswoman. 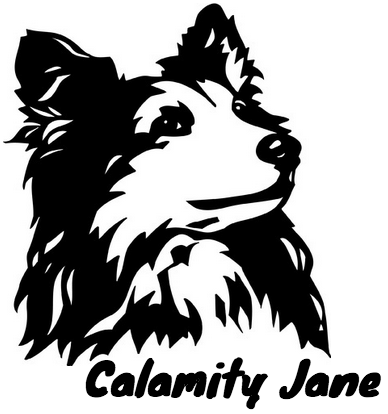 Calamity Jane the dog routinely got so dirty, in fact, that President Coolidge had a dog bathing tub specially built for the White House, primarily for the purpose of giving her the daily baths she needed. Already enamored of the collie breed thanks to the Coolidges, many Americans turned to the Shetland sheepdog as a better alternative as a house pet because of its smaller size. Also, after learning of the Coolidges’ problems with keeping Calamity Jane clean, preferences for tri-colors, sables, and merles eclipsed the all-white version of the breed. Even the AKC standard for Shetland sheepdogs says that those with more than half white color will be essentially eliminated from competition. Solid white Shelties are disqualified in the breed standard, for a good reason: the all-white trait is linked to blindness and deafness. Nothing to do with showing dirt!